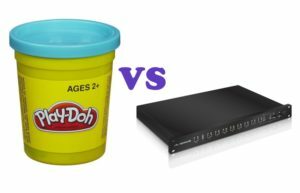 It’s the bake off you’ve been waiting for; a five-month real life test of a Ubiquiti ERPro-8 (EdgeRouter Pro) and a tub of Play-Doh™! Over a period of five months I carefully evaluated these two very useful items and discovered their good and bad points. But in the end, which will I choose as the ultimate winner? Each of the two competing items will be utilized over a period of five months for the purpose for which they were intended. The first item to be evaluated is the tub of Play-Doh™. I didn’t skimp on quality, and bought genuine Play-Doh™ as part of a set which included tubs of both light blue and red. Accessories in the box included a roller, a plastic cutting knife, four shaped cutters and an extruder with four built-in shapes as well as four interchangeable extrusion heads. The entire kit cost me $9.69 from Amazon, which I feel is pretty good value for the amount of artistic fun packed into a single box. The packaging was a little fiddly to get into at first, and the tubs – as always – were a little tricky to open and required more force than a typical child is able to provide. However, once open the tubs happily released their colorful content which was smooth to the touch. The accompanying tools had some slightly raised seams which perhaps should have been sanded off during the production process, but there were no sharp edges to be found, even on the plastic knife. The Ubiquiti EdgeRouter™ Pro 8 is an eight-port gigabit router capable of transferring over 2 million packets per second. 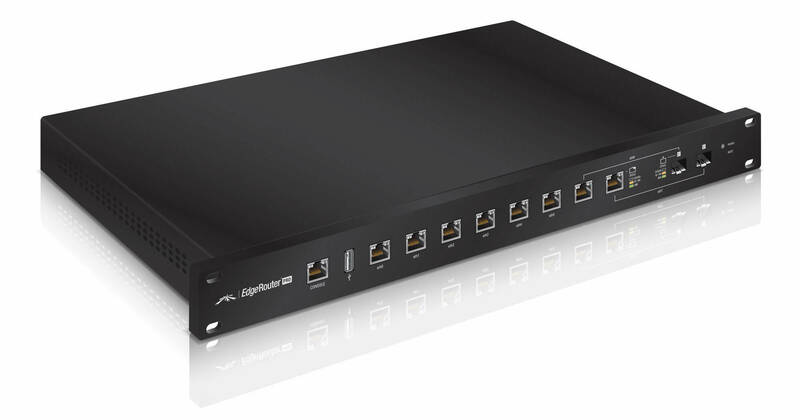 The ERPro-8 features eight copper RJ-45 ports and two gigabit SFP ports, though only 8 ports can be used at any one time (ports 7 and 8 can use either be copper or SFP). Price was a mere $215 from some guy on eBay, and the router was brand new in the box and unused. List price for those less daring and wishing to avoid eBay is $369, although they can be bought for $345 on Amazon. The ERPro-8 runs EdgeOS™ offers a web-based user interface (UI) as well as the option to configure using command line. Interfaces can be bridged together (with an optional layer 3 virtual interface), support 802.1q trunking, and LACP link aggregation. The OS can act as a firewall; by default the web UI supports an interface-based firewall (similar to a Cisco ASA), but by using the CLI it is possible to configure the ERPro-8 to run as a zone-based firewall instead (similar to a Juniper SRX). Once I had slid the ERPro-8 out of its covering and opened the box inside, I was delighted to find a very solidly-built 1U high 19″ rack-mountable chassis. The rack ears were not a separate accessory as the rack mounting is already built in as part of the thick, one-piece front panel. A power cable is included, and first impressions of the hardware were very good; all indications were that this was a well-built piece of hardware, and—as much as a piece of network hardware can be good-looking—it was attractive. What to say about Play-Doh™? Well, it’s fun and reusable, for one. I was able to make many different shapes, some of which bore a vague resemblance to things that people might recognize, and more of which did not. I was able to extrude the Play-Doh™ using the various built-in shapes as well as the noodly extrusion attachments, which meant I was able to make some create curly hair for the group of pretend Play-Doh™ friends I had made (don’t mock me, I need the company). Over the weeks and months, my Play-Doh™ companions and I had pretend picnics and feasts the likes of which are now legendary in introvert circles, though nobody really talks about them. 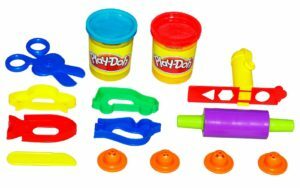 At the end of each meal, it was simple to pull apart my colorful mates and stuff them heartlessly back into the Play-Doh™ tubs ready to be reimagined the next time I wanted to revive them. Over time, I did lose a little of the doh , and some got a little dirty (my little folk are messy eaters), so after five months I have slightly less Play-Doh™ than I started with and it’s not quite as clean and brightly colored. Still, it was lots of fun! Initial set up of the ERPro-8 is fairly simple. The serial console port unusually, but pleasingly, defaults to running at 115,200bps and I thank Ubiquiti for that because I am perpetually frustrated by modern devices defaulting to the almost unusably-slow 9600bps. Tip to other vendors: I am very capable of looking up the default console port speed for a given piece of hardware and configuring my terminal software or console server accordingly; it is not necessary to always default to the lowest common denominator. Anybody who only has 9600bps support these days probably needs to consider a hardware refresh. Once in the web UI, the biggest challenge with EdgeOS™ for somebody used to Juniper or Cisco is that the terminology and the configuration logic is somewhat different. However, it didn’t take me long to adjust to the different approach to configuration, and soon enough I was able to configure the router with a gigabit link into my home network running 802.1q trunking. For my main home network I run a resilient pair of ISC DHCP servers, but I decided that for the purposes of simplicity I would configure the ERPro-8 to provide DHCP services for my other VLANs. In order to allow me to test the ERPro-8 before committing to letting it run my home Internet connection, I gave it a user-space address on my main home subnet and connected the outside interface to the built-in switch on my provider’s gateway device. 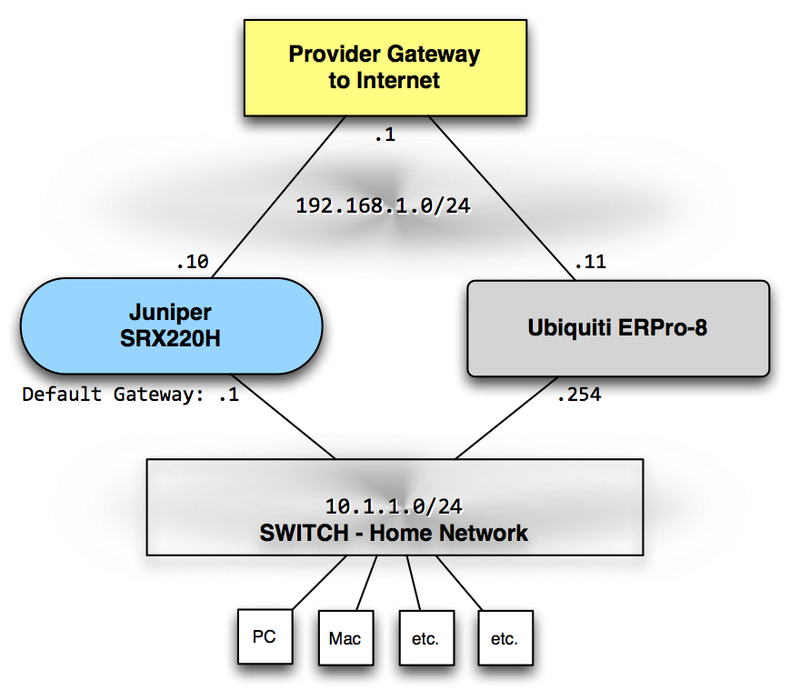 By manually configuring a default gateway of 10.1.1.254 on my test computer, I was able to run the Ubiquiti ERPro-8 in parallel to my existing Juniper SRX220H and ensure that everything was working before I switched the entire network over to use the Ubiquiti. I have internet service that my provider says is 1Gbps symmetrical, but with the Juniper SRX220H maxing out 950Mbps in ideal conditions, and more realistically delivering a whopping 300Mbps IMIX, I had been unable to validate the claim. Using the ERPro-8 as my gateway, internet speed tests confirmed that the ERPro-8 was delivering a very healthy 900+ Mbps of throughput, and I had no doubt that the ERPro-8 was not the bottleneck in this particular situation. After all, I was only connected to the home network over a single gigabit ethernet connection with no jumbo frames, so that’s pretty good going. I would have rushed to add an aggregated ethernet link between my home network switch and the ERPro-8, but since the WAN link was also running on a single gigabit Ethernet connection I felt this might be a somewhat pointless move. In operation, the system was stable and reliable. In order to shift all my home network traffic to the ERPro-8, I enabled VRRP with .1 as the virtual IP, and unplugged the Juniper SRX220H which currently had that IP configured. In an ideal world perhaps I could have run VRRP on both the SRX and the ERPro-8 so that in the event the ERPro-8 went down, the SRX could take over. Perhaps that’s a task for another time. Beyond that, the Ubiquiti ERPro-8 was exactly what I needed; a device that I did not need to log into very often, because once I had set it up, it just worked. My overall experience with the ERPro-8 was that it was simple to configure, fast, and stable. Plus, as a 19″ rack mountable device, it fit nicely into my network rack. The Play-Doh™ gave me hours of enjoyment. I did my best not to mix the colors because that would limit the reusability of the product, but some mixing did inevitably occur. However, despite five months of frequent extrusion, regular cutting with a blunt plastic knife, being rolled out and having shapes brutally stamped out of it by plastic cutters, at this point my only complaint about the Play-Doh™ is that some parts of it (usually those which I left out a bit long before trying to put back in the pot) have dried up very slightly, and the colors have dulled a bit. I simply disposed of a few tiny bits, which had totally dried out, and everything else, once mixed thoroughly back into the larger mass in the pot, recovered nicely. Given the minimal capital investment required to obtain Play-Doh™ for my home, I’m particularly impressed by the product’s longevity in the face of modeling fun. Over all, I give the Play-Doh™ play set a Highly Recommended. The Ubiquiti ERPro-8 performed like a champ for five months, and I was thoroughly impressed with its speed and reliability. And then, while installing a switch in the same rack, I managed to knock out the power lead. Internet outage in the house! Oh noes! Once I had calmed the children down, I plugged the lead back in and waited while it rebooted. Hmm, the internet is still down. I waited a couple more minutes, but no joy. I pinged my default gateway, but there was no response, suggesting that the Ubiquiti ERPro-8 was not responding. This is the point where the handy 115200bps console came into its own. Ruh roh; it looks like the power loss led to a corrupted file system on the flash. (I subsequently power cycled the device again, and you can read the entire boot log if you’re interested.) No worries, I told myself, I’ll reimage it and it should be fine. There seems to be an issue with the EdgeRouter. So i'd suggest you to file for an RMA if the Router is under warranty. you to file for an RMA if the Router is under warranty. No solution offered, no workarounds, just the option to file for RMA / warranty repair. That’s good except, as you had probably guessed, the down side of buying from eBay is that the reseller doesn’t offer a warranty (which is entirely reasonable). I didn’t expect success filing an RMA with Ubiquiti, and I was not disappointed; evidently while I had purchased a brand new device it had clearly sat on a shelf for a while because the date code indicated it was more than a year old so Ubiquiti won’t RMA the device. That’s ok, by the way; I don’t expect Ubiquiti to deal with devices indefinitely and I hold no grudge that they could not RMA a router with an old date code. I remain troubled that a router could suffer a power loss and be bricked with no resolution available. Digging around the Internet revealed that the Ubiquiti EdgeRouter Lite (ERL) and EdgeRouter PoE (ER-PoE) suffer the same issue, and a solution of sorts does exist. However, the solution did not come from Ubiquiti as one might have expected. Instead, a third party figured out how to write a tool which could be loaded on to the ERL and ER-PoE and could install a clean image so that the device could reboot. The only problem? It does not work on the ERPro-8. Firstly, why does this recovery solution not originate from Ubiquiti itself? What does it say about Ubiquiti Networks that the company is willing to leave owners of ERL and ER-PoE routers unable to recover their routers when clearly a technical solution exists (but somebody else had to create it)? Worse, why is the ERPro-8 left with no option for recovery? Many network devices are able to install new firmware by booting from a USB drive with appropriate files installed on it; not so for the ERPro-8. The Quick Start Guide for the Ubiquiti ERPro-8 describes the USB port as Reserved for future use. You know, I think I’ve found a current use for that USB port, and it might help Ubiquiti retain a few customers too. Another common method of directing a blank device to a firmware image is to use a network boot of some sort, relying on DHCP to point the router to a location where it can download the firmware itself or a loader program (think PXEboot, ONIE and similar). Some may require vendor software to be run in order to discover the device on the network and load the firmware. Again, it seems that there is no solution for the Ubiquiti ERPro-8. What I have, after five successful months of use and one power loss, is a pile of steel and electronics which is too large to be used as a door stop, and too small to be used as furniture. My Ubiquiti ERPro-8 has been bricked by a simple power loss, and there is no way to recover it (at least not one that Ubiquiti, even once it knew it wouldn’t have to deal with it under warranty or RMA, was willing to share). After five months, the Play-Doh™ kit probably has a higher resale value than this Ubiquiti EdgeRouter Pro. Think about it; neither my bricked Ubiquiti ERPro-8 nor the pile of poop are any use whatsoever in the role of a network router. Both have their own particular aesthetic appeal, but neither is really of any use to anybody. Actually I take that back. 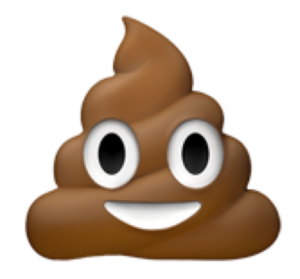 I can send the smiling pile of poop in messages to my friends as many times as like, so the poop pile does in fact have a purpose. 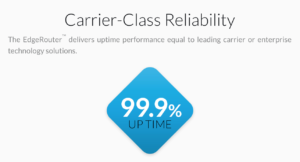 Seriously Ubiquiti, what is the point of touting high uptime when the chances are that a power loss could apparently lead to high downtime? After my five month evaluation of the Ubiquti ERPro-8, I suspect that the only positive thing to come out of this will be that I get to loose some aggression on the router with a large hammer. I’d use a baseball bat, à la Office Space, but I’d hate to damage the baseball bat on the ERPro-8, because—credit where it’s due—the case looks quite sturdy. DO NOT UNDER ANY CIRCUMSTANCES BUY THE UBIQUITI EDGEROUTER PRO (ERPRO-8). IN FACT, AVOID IT LIKE THE PLAGUE. IF SOMEBODY BUYS YOU ONE, ASSUME IT’S A BAD ATTEMPT AT A GAG GIFT AND THROW IT BACK AT THEM. I do not offer this advice lightly. I have been a big fan of Ubiquiti devices for a while now (even before I owned some myself) and in addition to the EdgeRouter Pro described here I also own three UAC-AC-PRO wireless access points and a Unifi US-48 Switch. I like this hardware and I think it’s good value for money. Unfortunately, the EdgeRouter Pro just proved to me that ultimately, perhaps you really do get what you pay for, and going forward I will be actively recommending against investment in Ubiquiti products unless somebody can convince me otherwise. If you’re asking yourself why I would recommend against all Ubiquiti products, the answer is fairly simple. Think about it: the corrupted squashfs issue was reported on the Ubiquiti forums in May 2014. It may have occurred before then too, but let’s be generous and take that as “patient zero.” In the three years since that time, Ubiquiti has apparently done nothing to resolve an issue known to totally brick the EdgeRouter Pro. Shame on you, Ubiquiti; shame on you. If this is how Ubiquiti Networks treat their customers with one product, I see no reason not to assume that the same couldn’t care less attitude has been applied across the entire portfolio. I’m not willing to put my own reputation on the line and recommend Ubiquiti Networks products to others on the off chance that this is an isolated example. Given the choice between wasting endless hours trying to recover my bricked ERPro-8 or wasting endless hours extruding Play-Doh™ into absurd piles of noodly nonsense and smooshing it with my fingers, I choose Play-Doh™ as the winner of this five month evaluation. Congratulations, Hasbro! Meanwhile, I’m going to start digging into a page I found recently where somebody thinks they might have a potential solution to reinstalling a backup using ‘dd’. I guess I’ll find out, because apparently Ubiquiti Networks isn’t going to help me with this. Great post. Please update if you find anything new out about unbricking this device. Seems unreal to be in this situation. I run openwrt for lab routers and am very happy with the features and performance. Outstanding post. While I lament your ubiquitous woes, your humorous presentation is a hoot. Sending this to all my friends. Good luck finding a solution. What a lucky find. I was looking for a humorous router review. Sad that you can’t re-image a file system. It might make a good shotgun target! My medium business bought a number of 48 port UniFi switches; we quickly discovered all kinds of problems including kernel panics (we have a heavy, and probably uncommon for most UniFi customers, multicast traffic load). You’d think that if you could reproducibly cause one of their products to kernel panic that Ubiquiti would be interested – nope, despite providing copious logs and so on, we didn’t hear a peep from ubnt other than “we’ll get back to you” (they didn’t). Fortunately we hit these issues from day 1, so were able to RMA them. Ubiquiti’s products are great right up until they’re not, at which point you may as well throw them out as you won’t get any support.